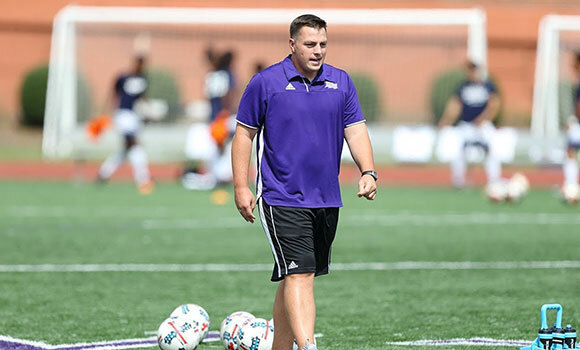 UNC Greensboro today announced that EJ O’Keeffe, a two-time Big South Coach of the Year, has been named the men’s soccer head coach after a national search. The move represents a homecoming for O’Keeffe, who played at UNCG for three seasons, serving as team captain and leading the Spartans to the 2008 Southern Conference championship and NCAA Sweet Sixteen. The Greensboro native joins UNCG after spending the last nine years at High Point, including four seasons as head coach where he was twice named Big South Coach of the Year and had the Panthers ranked as high as No. 12 nationally last season. O’Keeffe is also an official US Soccer National Team Scout and is a member of the United Soccer Coaches National Ranking Committee, United Soccer Coaches Regional Ranking Committee, and the NCAA Regional Ranking Committee, along with being a MLS Combine Scout/Liaison. Prior to his time with the Panthers, O’Keeffe was the Director of Recreation, Championships, Discipline and Appeals for the North Carolina Youth Soccer Association, where he managed a yearly $900,000 budget. UNCG will hold an official welcome for O’Keeffe on Wednesday, Jan. 16, at 12:15 p.m. It will be streamed via YouTube. Read more about O’Keeffe on the UNCG Athletics website.